The most easiest and beginner friendly WordPress landing page builder and onepage builder plugin to help you make website better and faster. Install from WP repo or upload the zip file, its just one click process. Select from 100+ pre-designed premium templates and blocks. Input your content and your beautiful looking website is ready. Hit the publish button and let the world see your beautiful website. I’m very satisfied with this plugin after trying several onepage themes. They were all much to complicated. This plugin fits my needs perfectly! Thank you. 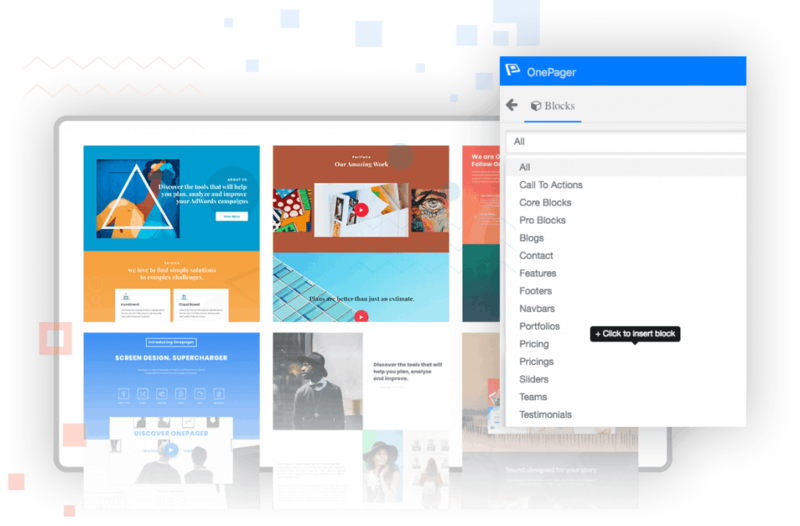 WPOnepager is the best WordPress landing page builder plugin. 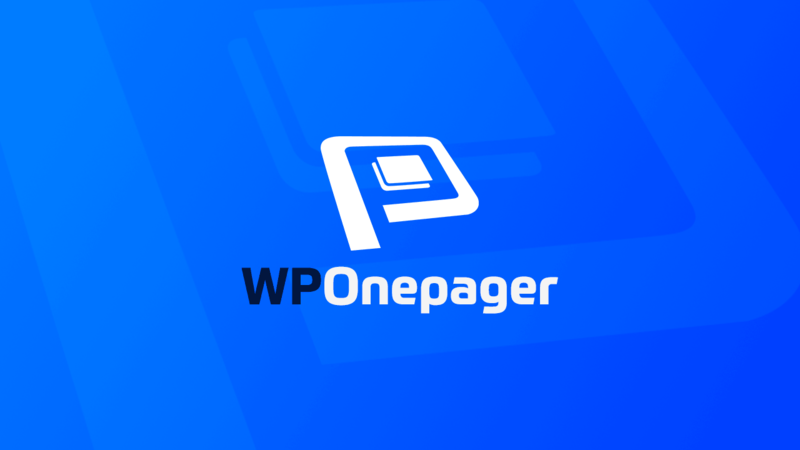 Here are the features that makes WPOnepager the most powerful and user-friendly WordPress onepage builder in the market. Insert any block within one click. This is the most fastest way to add blocks in your page. Drag & Drop to right place is a tedious process. Your site built with WPOnepager is entirely SEO friendly, it will be easier for Google to rank your site. No matter which sized device your users use, your site will look always perfect which is built with WPOnepager plugin. You do not need to write a single line of code, cause everything is already coded with latest web standard. Lucrative animations are ready, all you have to do is insert and make your site. Don’t worry it will only take some minutes. Mesmerizing animation effects that will force your users to get attracted. Give a different angle to your users to view your website built with WPOnepager. Typography of every block has been selected carefully so you feel comfort while reading. 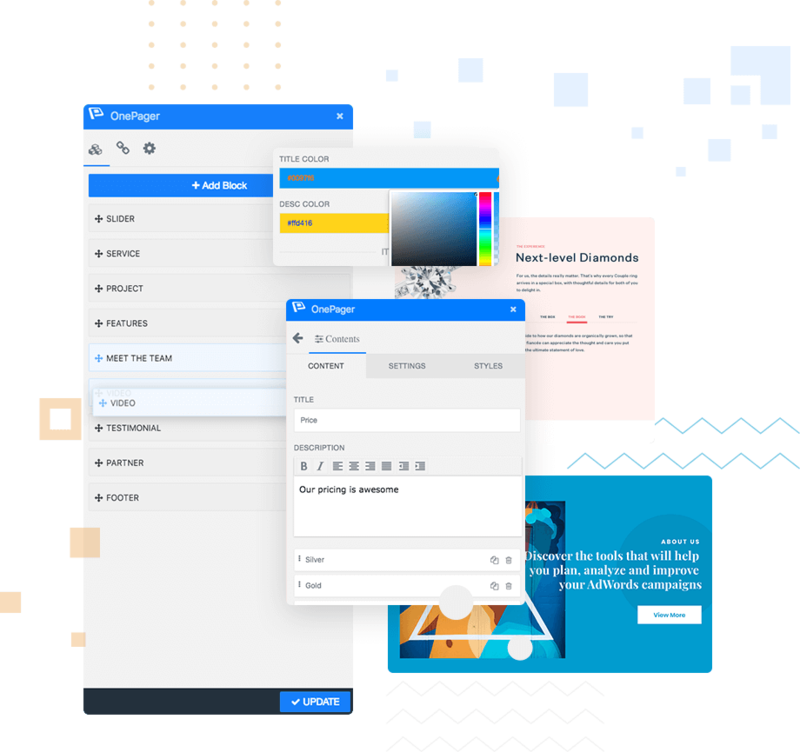 You don’t need to think and design pages like construction or coming soon, leave that worry to wponepager. It will take only a minute to create whole page. I was looking for page builder for my theme and all the “favorite” builders have some issues, but this works like a charm and it looks beautiful! Good work! Blend beautify with artistic designs and create magnificent full-screen websites all by yourself, without compromising the performance. Your purchase is 100% Risk-Free – use WPOnepager for 7 days and if you’re not happy, simply let our friendly team know and they’ll be happy to refund you in full. We do not limit how many landing pages, sales pages or other marketing pages you can create on each site you license with WPOnepager. Is WPOnepager a monthly recurring payment to use the system? No! There are no monthly fees with WPOnepager. You buy the software package (you get the WordPress theme & plugin versions included) and you can use these on as many sites as your chosen license package allows. Your purchase includes 1 year of support and updates. After 1 year, there is an optional renewal if you want continued support and the latest updates. Who controls my content built with WPOnepager? Can I create multiple landing page? Of course you can create as many landing pages you want. There is no limit for creating landing page, onepage or sales page with WPOnepager. What other tools do I need as well as WPOnepager? WPOnepager has been designed as a complete tool for building your marketing websites and landing pages. Our page building system will help you create all the pages you need, our free WordPress theme can be used for building your blog. Do you provide support if I get stuck using WPOnepager? Of course! Our friendly support team are available to help you through your issues. Our team are in chat and email to help get you up and running. If you’ve been around the block very long, you know that there’s one big risk when buying a theme or plugin from a small, new company: they could go out of business and stop providing updates, which means your website would quickly go out-of-date. We maintain a fiercely loyal following of customers for one reason: we provide unbeatable support with frequent update of our products to make sure your website load faster and work smoother. We are a team of WordPress experts working since 2010.